I found Bimble Solar very helpful and accommodating. Excellent service, I collected goods, but part of order was out of stock, I was kept informed when outstanding parts were expected. A Great easy all in one solution for a very reliable manufacturer. This makes solar easy, you just plug it all in and away you go! 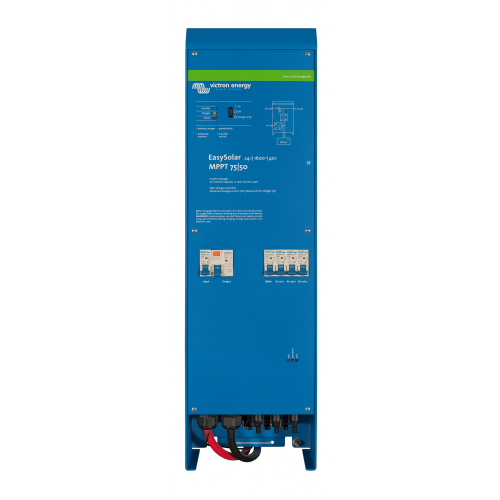 The solar charge controller: BlueSolar MPPT 75/50 Up to three strings of PV panels can be connected with three sets of MC4 (PV-ST01) PV connectors. The MPPT charge controller and the EasyPlus inverter/charger share the DC battery cables (included). The batteries can be charged with solar power (BlueSolar MPPT) and/or with AC power (inverter/charger) from the utility grid or a genset.